In an era dominated by male groups, it took an unlikely quintet of public school teens to show the world that a female group could succeed. 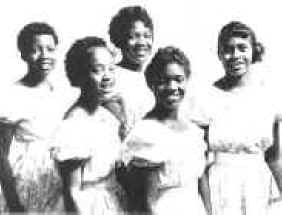 The Bobbettes were the first female group to have both a Top Ten hit and a number one R&B record. It all started as a pastime for eight girls ranging in age from nine to eleven in New York's Harlem. Schoolmates that began singing in the glee club of P.S.109 in 1955. Calling themselves the Harlem Queens, they began by doing local amateur nights. Gradually over the next two years the octet shrunk to a quintet. After appearing at the Apollo Theater's famed amateur night, they didn't win, they broadened their already growing following. Soon thereafter, James Dailey took over the group's management. Feeling that "The Harlem Queens" wasn't an appropriate name for five girls in there early teens he changed the name to the Bobbettes. Dailey got them a recording contract with Atlantic Records and had them in the recording studio by the end of February 1957. Their first four recordings were group compositions and it wasn't a fluke. They would write ten of their first eighteen recorded songs. The group had already written a few songs and one which was the legendary "Mr. Lee," who was actually a teacher of some of the Bobbettes. The group's first single was released in June 1957. Although the lyrics speak glowing of "Mr. Lee," the original lyrics were not the least bit flattering. The girls had an immense dislike for the teacher and the song was originally written as a put down. At the request of Atlantic's A&R executives the group revised the lyrics to make it more commercial or possibly less controversial. "Mr. Lee" became the best known teacher in America as the record went Top Ten in July 1957. "Mr. Lee" also, spent for weeks at the top of the R&B charts. Their next four singles, between October 1957 and summer of 1959, failed to make the top 100. During this time the girls were doing - "one-dayers" - theater bookings - since they were to young to do club dates or "one-nighters." They also did uncredited background singing for "Clyde McPhatter and Ivory Joe Hunter. Their last recording session for Atlantic in February 1959 included the sequel to "Mr. Lee" "I Shot Mr. Lee." This time the girls got to say what the felt about him. However, Atlantic shelved it and released "You Are My Sweetheart. A nice but undistinguished doo wop ballad, it failed to chart. The Bobbettes left Atlantic and signed with Triple X. Their first release "I Shot Mr. Lee" shot to the top of the charts forcing Atlantic to release the original version. The Triple X record peaked at fifty-two on the national charts. This incident more than likely helped institute the so called "five year clause" in recording artists contracts, in which an artist could not record the same song for another company for a minimum of five years. The Bobbette's next record was a remake of the Domino's "Have Mercy Baby" and reached number sixty six. Despite having charted three records with Triple X, they found themselves on the Gallant label in the fall of 1960. There they recorded Eddie Fisher's early '50s hit "Oh My Papa." From there they went to End Records and did the old standard "Teach Me Tonight." Their last charted single (as a featured act was an answer song to Chris Kenner's "I Like It like That" called "I Don't Like It Like That." It was issued on Gone Records, like End a George Goldner label, and reached seventy two on the national charts. During the next five years, 1961 to 1966, they recorded on six labels. It seems there manager would have them record a few sides and then move them to a new and better deals before the release of their previous label's recordings.Their longest stay after leaving Atlantic was at Diamond Records, where they recorded six records. Before their first Diamond release they sang backup for Johnny Thunder on "Lop De Loop" (#4), there last chart record and second Top Ten hit. Too bad they didn't get credit for it. In 1964, the group recorded "Love That Bomb" for the motion picture Dr. Strangelove while continuing to record unsuccessfully for Diamond. In the spring of 1966 they signed their first major label RCA, but the results stayed the same. Five years pasted before their next and last recording opportunity, on Mayhew Records (1971 to 1974). The Bobbettes remained together through the 70s oldies revival, touring the United States and England.